The simplest way to freeze your Experian credit report is online. If you don’t anticipate needing to apply for credit in the near future, you should consider a credit freeze. It’s the best way to prevent your credit report from being accessed by unscrupulous people. Federal law now requires that all freezes and unfreezes be free for all consumers. That can be a game-changer for those who were deterred by potential costs. You’ll still be able to use credit as you do now, but you won’t be able to apply for new credit without first lifting the freeze. That means if your personal data was compromised during a breach, no one else can use it to create a credit account, protecting your credit and saving you time and aggravation in trying to clear it up. All three credit bureaus — Equifax, Experian and TransUnion — offer this option, also known as a security freeze, for protecting your credit. You can access a short form online, and you will be asked for some identifying information — name, Social Security number and birthdate. You’ll also get an opportunity to select your own PIN, if you prefer that to being assigned one. You’ll then be asked identity verification questions, typically involving past addresses or credit accounts. Once you correctly answer those, you’ll see a screen that says “Security freeze successfully added” in a green bar at the top. The body of the message includes your PIN. At the bottom of the page are two buttons, “Print” or “Email my PIN.” Choose the one you want and take care of that number, because you will need it to lift the credit freeze. 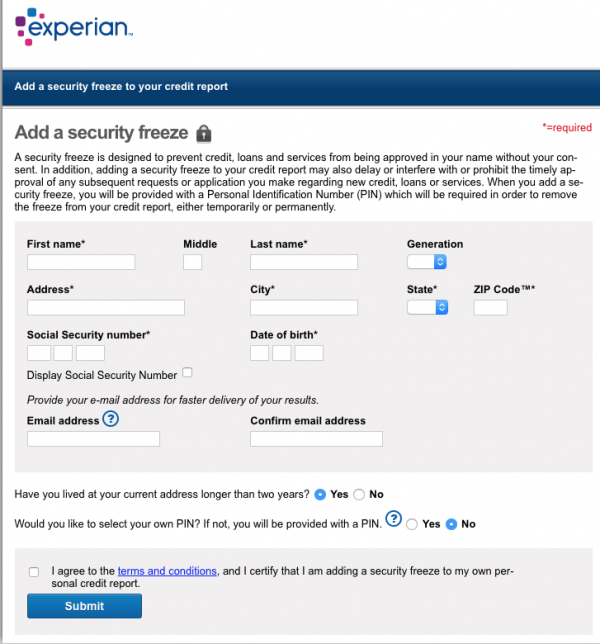 If you prefer to use the mail, you can send your request to Experian Security Freeze, P.O. Box 9554, Allen, TX 75013. Experian has information on its website that should help you figure out what information and documents you may need. In general, you’ll need to include your full name (including generation, if applicable), Social Security number, birthdate, two years’ worth of addresses, a government-issued ID card, such as a driver’s license, and a utility bill or other acceptable proof of address. You’ll receive your PIN via postal mail. If you prefer to start the process by phone, the number is 888-397-3742 (888-EXPERIAN). You’ll be asked to provide personal data, such as your Social Security number, full name, birthdate and recent addresses. Once your identity is confirmed, your credit can be frozen and you will receive a PIN by postal mail. Because credit reporting agencies don’t share data, except in the case of placing a fraud alert, you’ll need to place a freeze at all three credit bureaus. NerdWallet has step-by-step guides for freezing Equifax and TransUnion credit as well. And keep up with your PIN. Though it’s possible to retrieve a lost PIN, it’s less hassle and faster if you know where to find it when you need it.